Do you want to know the age of your Mac? Do want to gather the technical specs of your Mac so you can sell it on Craigslist? Do you want to find your Mac’s serial number so you can determine if it is still covered by its warranty? If so, you could use Micromat’s free MachineProfile. This free application lists a myriad of details in one convenient screen. All of these details are readily available on your Mac, just not on one screen. MachineProfile lets you easily save the details as PDF or text file. It also lets you email the details. I regularly ask clients to send me a profile of their Mac so I can answer questions about its upgradability. MachineProfile only works on Macs with Intel processors running OS X 10.6.8 or higher. That’s far from every Mac, but even the first Intel macs released in 2006 can run OS X 10.6.8, so this application could run on a great number of Macs. It’s a very handy utility since it also lists the maximum version of Mac operating system supported on your Mac. Apple indicated that the latest version of Mac operating system, OS X Mavericks, will be released in the fall of 2013. If you’d like to determine if your Mac can be upgrade to OS X Mavericks, then get an updated copy of MachineProfile which will indicate if your Mac can handle it. Below is an image of a Mac’s profile. 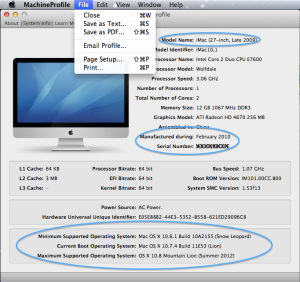 Highlighted are the Mac’s model, manufacture date as well as the minimum, current and maximum supported operating systems. You can also see that this profile can be easily emailed using a command in the File menu. Read more about age, details, MachineProfile, maximum, Micromat, operating system, technical specs.